A good quality lacquered brass polarising microscope by Watson Brothers of 4 Pall Mall, London, with signature to the base and bearing the serial number 5152. The instrument, which is in good condition, dates to circa 1885 and comes with a selection of lenses; but it is not certain if this is a complete set. There are no other tools present. The microscope has its original mahogany case with its key. To the base of the case is a drawer for slides and ‘tools’ such as tweezers. 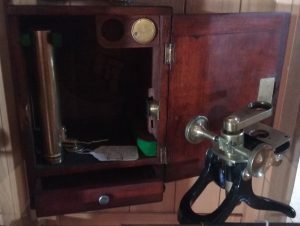 The drawer contains 3 blank slides, the case key and a lens for which the brass case in missing. Thomas William Watson first made this type of microscope in circa 1879. He was the son-in-law of William Tranter, the famous Birmingham gun maker. In 1885, Thomas Watson was joined by his brother and the business became Watson brothers.